Very much an ideal garden variety, Loch Maree is completely thorn free and also has unusually pretty lilac pink double flowers, making this variety suitable for use in the ornamental part of the garden. The growth is very easy to maintain and is semi-erect, meaning it can be grown without support if required. 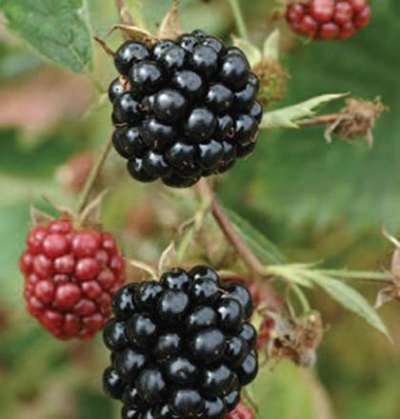 Recommended as one of the best tasting thorn free Blackberries, the rounded dusky black berries ripen from late July, the fruits produced in tempting clusters of 6-8 perfect fruits or more. Can simply be cultivated as an open growing bush so a very simple and impressive variety to grow. Loch Maree just has to be tried!